Remember my Peach, Passionfruit Yogurt and Banana Cake from the other week? Well, I’ve made a slight variation to it and made it even yummier! Is that even possible? Well it’s simple really. I’ve dropped in some bits of chocolate and added a touch of fun (in the name of salted caramel popcorn) and delivered it with a bang! Are you ready for it? This is perfect for a mid-week pick-pick-me-up! Preheat oven to 180 degrees Celsius (160 degrees Celsius fan forced). 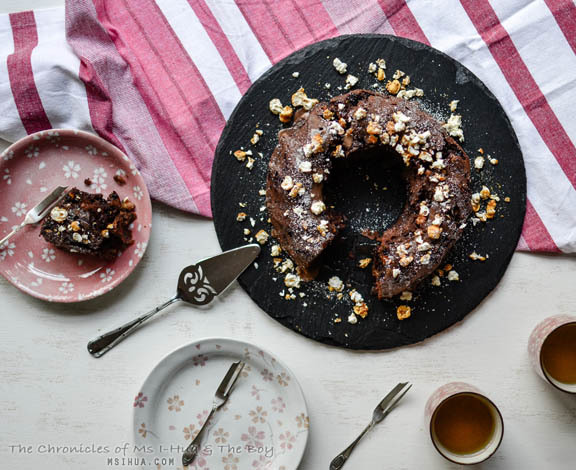 Grease a 9 inch (22 cm) Bundt Cake pan with grapeseed oil or vegetable oil and set aside. Place flour, baking powder, cacao powder, sugar, grapeseed oil, eggs and the yoghurt in a large mixing bowl. Using a wooden spatula, thoroughly mix all ingredients together until a smooth and thick consistency is formed. Add in the mashed banana and chocolate chips and continue mixing it. Pour the cake batter into the prepared bundt pan and bake in the oven for 50 minutes or until a skewer (or toothpick) comes out clean. Once cooked, remove from oven and let cool in the tin for 5 minutes before turning it over onto a cake stand or a serving plate. 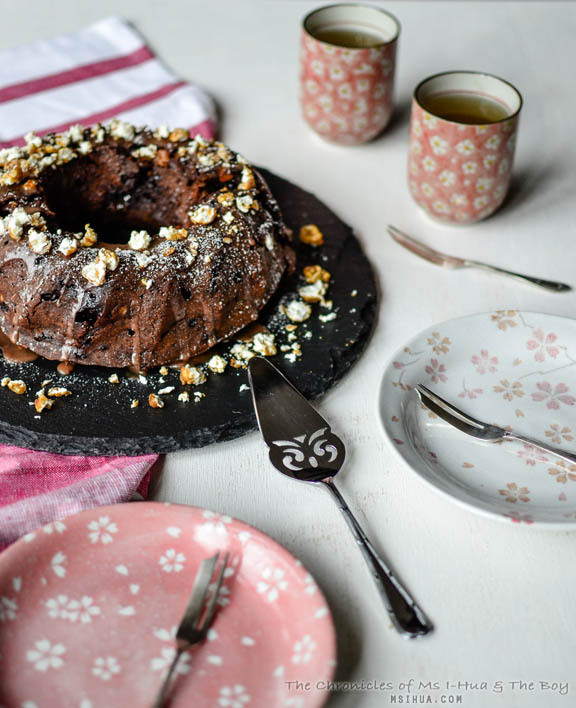 Let the cake cool completely before dusting with some icing sugar and tossing with salted caramel popcorn. So what do you say? Would you like some chocolate cake in your life with hints of tropical ooh la la? I think you do! Get on the yoghurt cake train! Toot Toot!! I really need something sweet right now, your photos are torture! Chocolate and popcorn make everything better – love it! Oh yeah.. or smuggle into the movies! Actually, no, I don’t think it’s possible, because the non-chocolate version would definitely be better. But each to their own. I understand why you felt the need to try something new, but let’s keep chocolate out of fruity desserts next time, yeah? Yeah. your previous cakes already look really good!and salted caramel popcorn for the win! Wuhoo! Have you been baking?